by arieta vakasukawaqa and deptfo , suva. 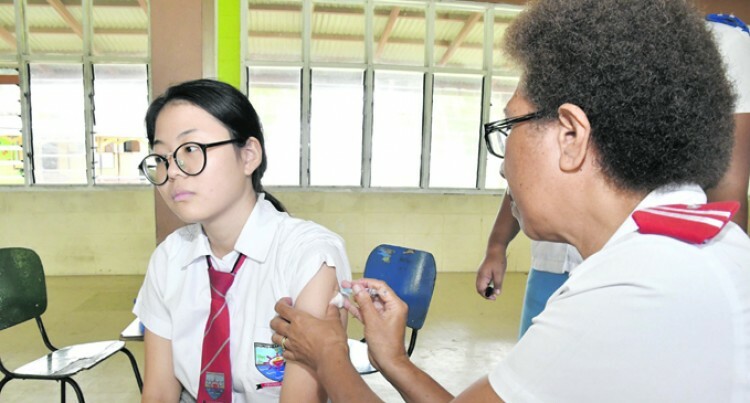 The nationwide meningococ­cal vaccination campaign began yesterday. In the Central Division, students from Deenbandhu Primary School, Veiuto Primary School, Sacred Heart Secondary School and Saint Agnes Primary School were part of the first batch of schools to go through the programme. The ministry is targeting more than 333,876 children aged one to 19 years. The vaccination not only protects individuals from life-threatening diseases but it also offers protec­tion to the community at large. The ministry is urging all parents, guardians, children and friends to make good use of this opportunity because the cost of having to deal with a meningococcal infection is devastating and costly. In Rakiraki, 34 students from Rakiraki Muslim Primary School were vaccinated yesterday. Headteacher Mohammed­Shaheem said that a team of six officials from the Health Ministry were at their school to vaccinate students. “Altogether there are 146 students in this school including kindergar­ten, but some students were absent and health officials will revisit the school to give out vaccination to these students,” he said. “They were given consent forms for parents to agree whether they wanted their children vaccinated or not. I want to thank the parents for their full support in agreeing to get their children vaccinated. “I want to thank the Government for doing this early, especially for our young ones to protect from getting this deadly disease,” Mr Shaheem said.